The ELIT-1050 4K/UHD Digital Signage Player is suitable for advertising boards, self-ordering systems, retail applications and multi-media kiosks applications. The device is embedded with Intel® Braswell Celeron® N3060 CPU and supports dual-HDMI for 4K/Ultra HD displays. The unit comes with built-in 32GB eMMC flash memory and two 204-pin DDR3L SO-DIMM sockets. 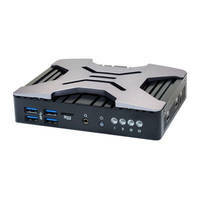 It features one Micro-B RS232 half-duplex, four USB 3.0 ports, one Micro-B USB 2.0 and two RJ-45 jacks. The player has an optional WiFi and Bluetooth module. The compact ELIT-1050 digital signage player has built-in 32GB eMMC flash memory and two 204-pin DDR3L SO-DIMM sockets which support up to 8GB of 1600MHz SDRAM. The unit offers rich I/O connectivity with one Micro-B RS232 half-duplex, four USB 3.0 ports, one Micro-B USB 2.0 and two RJ-45 jacks. Also, for the support of expansion bus, there is a full-size mini-PCIe slot with SIM socket for a 3G module or mSATA, and another half-size mini-PCIe slot for an optional WiFi and Bluetooth module.The ELIT-1050 offers a choice of Windows® 7 or Windows® 10 operation system for flexible deployment upon requirement, and with its palm-size and low power consumption designs that offer sufficient storage and expansion capability for easy implementation.